If you are looking to stock your library, you can’t go wrong with this list of books. These are the books that are literally on my desk, listed in order from top of the stack to the bottom. If you are a fan of Edward Tufte, you need this book. If you don’t know who Tufte is, you need this book, and all of Tufte’s books . It is chock full of ideas for visualizing data in more meaningful ways. This is on the top of the stack because I just got it- it is quite lovely. By Todd Warfel. Rosenfeld Media, November 2009. These concepts completely changed the way we do business. Full of real examples of how to use different popular tools for prototyping. this is # 2 in my stack because I had to look up some information about prototyping with Fireworks this morning. The book is available exclusively from Smashing Magazine. This book looks at Web design rules of thumb, color theory, usability guidelines, user interface design, best coding and optimization practices, as well as typography, marketing, branding and exclusive insights from top designers across the globe. Oh, and one of my applications, OtherInbox, is in the first chapter! By Bill Scott and Theresa Neil. O’Reilly Media, January 2009. Yeah, I know this is our book, but it really is on my desk. I use it for reference at least once a week. I had to look up ZUIs, zoomable user interfaces, earlier this week for a project. By Joshua Porter. New Riders 2008. Great, great read. Worth every penny because it is full of practical advice. Make sure you also look at Joshua’s talk on SlideShare: Designing for Social Interaction. I don’t necessarily refer to this book every day, but I recommend it to at least five start-ups a week. By Christian Crumlish, Erin Malone. O’Reilly Media, September 2009. 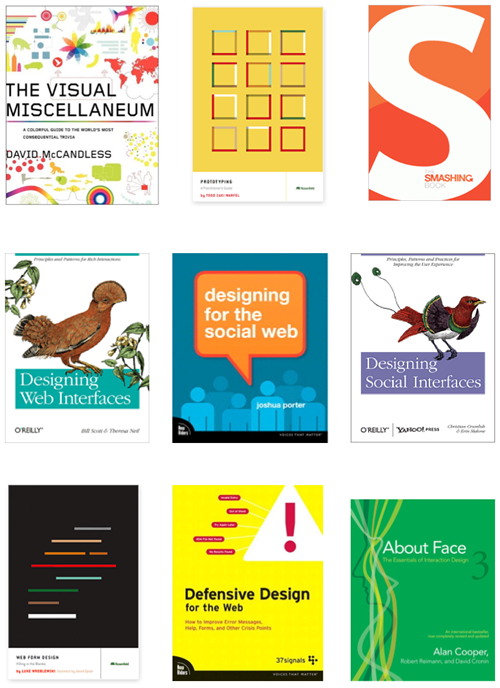 “This book is a fairly exhaustive catalog of most UI patterns in place today with sites that integrate social networking. There are some very interesting discussions about each pattern, when to use it and who uses it. ” from an Amazon review. I need to pull this book out of the stack and take it with me on the plane next week. Great list. I still need to check out the “Prototyping” book. It seems prototyping is quite the hot topic right now!